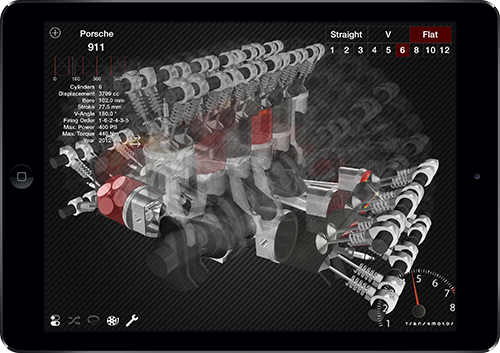 Trans4motor is a simulator where you can control the movements of single cylinder to 12 cylinder 4 stroke engines on the iPad/iPhone. Recommended to anyone interested in car and motorcycle engines. This is for those who have a relentless love for engines and want to enhance their knowledge. Select from inline to V-type, or other multi-cylinder engines, and watch the running engines transform over continuous CG animation. 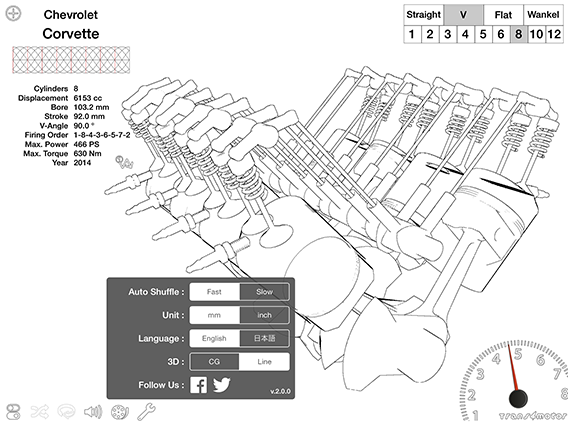 Enjoy watching the inline engine camshaft separate into two parts as it transforms into the V-type engine and how phase angle modulation between cylinders makes the crankshaft rotate, separate, and combine into many engine formations. Developed in technical collaboration with "CAI MEDIA CO.,LTD. 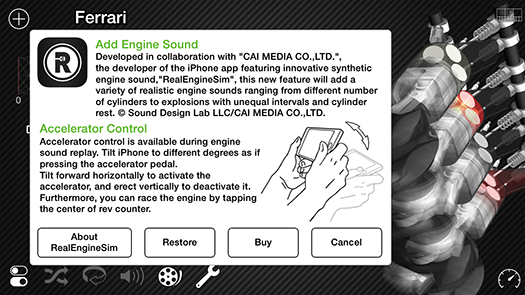 ", the developer of the iPhone app featuring innovative synthetic engine sound, "RealEngineSim" this new feature will add a variety of realistic engine sounds ranging from different number of cylinders to explosions with unequal intervals and cylinder rest. © Sound Design Lab LLC/CAI MEDIA CO.,LTD. 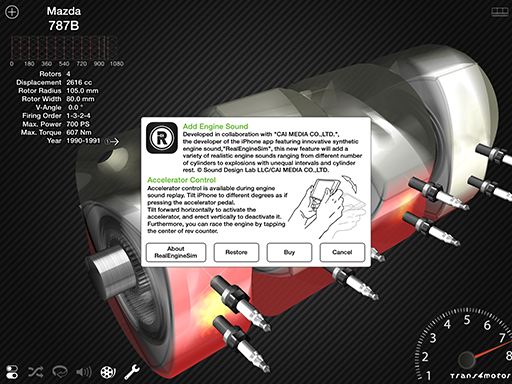 Engine Sound Add-On is available via In-App Purchase. 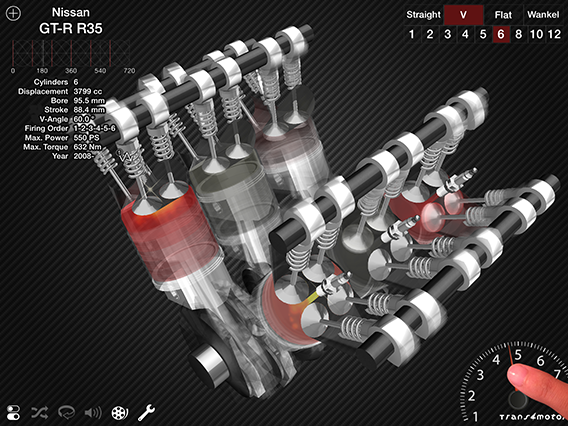 Accelerator control is available during engine sound replay. Tilt iPhone to different degrees as if pressing the accelerator pedal. Tilt forward horizontally (as if pressing the accelerator) to activate the accelerator, and erect vertically (as if releasing the accelerator) to deactivate it. Furthermore, you can race the engine by tapping the center of rev counter. There are currently 22 types of engines registered. Through automatic network updates, continuous expansion is planned. In addition, there are functions installed that allow users to newly register and edit engines. Able to adjust setting for engine bore stroke, firing order, and ignition timing. 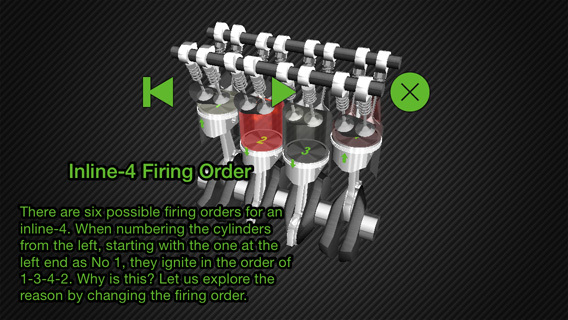 Easily replicate on the iPad, engines with unequal combustion intervals for two-wheelers, Inline-four crossplane or V5. Recorded 3 controllable presentation videos. Additional functions planned in the future. ・Functions to post and share engine specs that you have created. ・OHV(V2), SOHC, W engines support. The CG animated engine rotates at one tenth of the actual speed to enable users to learn the structure and to enjoy the visual. The company and product names used within the application are generally registered trademarks or trademarks of the respective companies. 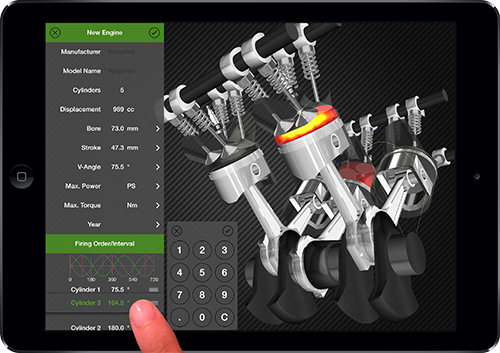 The objective of this application is to upload engine specifications disclosed to the public and to learn about general information regarding engines. It does not accurately replicate actual machine measurements and designs. Copyright © 2014-2018 Kitt Peak, Inc. All rights reserved.